This article was written by Stephen Lewis from the The Open University. It was originally published by The Conversation. The weather might seem like it creates weeks of dreary, grey drizzle. But it can also put on a truly sensational - and, often, deadly - show. But what explains these explosive events? Earth’s atmosphere is driven by heating from the Sun. Weather is the response of the atmosphere to the uneven pattern of heat energy that it receives. Visible and ultraviolet light warms Earth during the day, more strongly at low latitudes, but Earth emits an almost exactly equal total amount of infrared radiation in all directions. On average, Earth receives 340 W m-2 from the Sun. 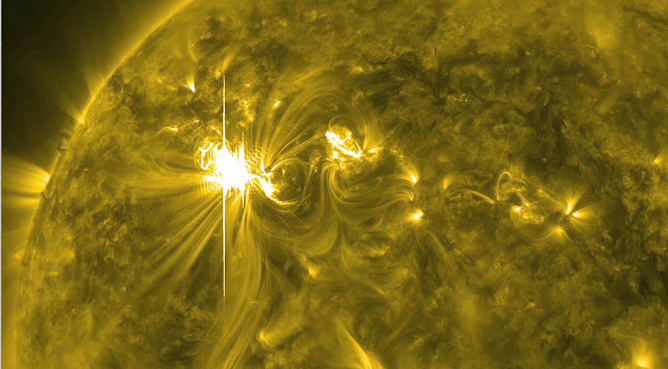 About one third of this energy is scattered straight back into space by clouds and ice on the surface. The remaining energy, roughly the equivalent of placing a small radiator every 2 metre in a lattice covering Earth’s surface and running them continuously, is absorbed by the surface and atmosphere. But the Sun’s power is focussed on the day side and, in particular, near the Equator. On average, the atmosphere and surface absorb over 300 W m-2 in the Tropics but less than 100 W m-2 in Polar Regions. Earth’s surface at the equator is face-on to the Sun’s light, but at a large angle to it near the poles where the same power falls over a larger surface area. Earth’s temperature does not show extreme variations, varying by less than 50° C between Equator and high latitudes, much less than on a body such as the Moon. This is because the atmosphere (and to a slightly lesser extent the oceans) transports heat from warmer to cooler regions. Atmospheric heat transport peaks at about 5 PW (5 petaWatts or 5 × 1015 W). For context, the largest nuclear power station has a capacity of 8 GW (8 × 109 W) and the total power consumed in all forms by humans today is estimated to be 18 TW (1.8 × 1013 W), over 250 times less. This vast power supply is what drives the heat engine of Earth’s atmosphere and oceans, and the resulting motions of warm air to cooler regions. Along the journey, energy is transformed into many other forms and the rotation of Earth has a profound influence on the form the weather takes, especially at middle latitudes. Here the prime means of heat transport changes from the longitudinally-symmetric over-turning Hadley Cells to wave-like motions, the surface manifestation of which are our familiar high and low pressure weather systems. 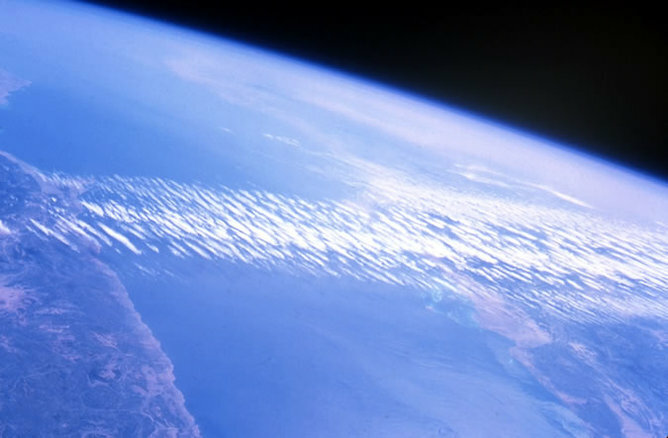 Jet streams are very narrow ribbons (a few kilometres deep and maybe 100 km wide) of fast moving air that circle Earth and form on the boundary of warmer and colder air masses at about 10 km altitude. In the core of a jet stream, winds can reach 200 km hr-1 and an amazing 656 km hr-1 has been recorded over the Outer Hebrides in December 1967. The location of these focused winds is vital to planning aircraft routes and clever use is the reason why it is faster to fly from west to east than the reverse journey. The jet stream that most influences our weather is the northern polar jet stream which meanders in a varying route and guides the passage of weather systems around the globe, potentially leading to a series of storms and flooding. When the jet stream curves south then cold polar air will be brought down, when it curves to the north, warm air and settled weather may result. Tropical cyclones, better known as hurricanes in the Americas and typhoons in the Far East, are massively destructive weather events that at lower latitudes, begin as weaker, low-pressure weather systems. Tropical cyclones form over very warm seas, typically in late summer and autumn in each hemisphere. As they intensify they become driven by latent energy release from water vapour, which condenses to form the high storm clouds. Wind speeds of over 200 km hr-1 have been recorded around the centre of a storm, but devastation is mainly caused by flooding as a result of the surge in sea surface height and the intense rainfall. The average UK annual rainfall may fall in less than two hours from the clouds around the eye of the storm. The 1970 Bhola cyclone was one of the worst natural disasters of all time, killing half a million people in Bangladesh and West Bengal largely as a result of such flooding, but it was far from the most powerful tropical cyclone, rating a relatively moderate Category 3. 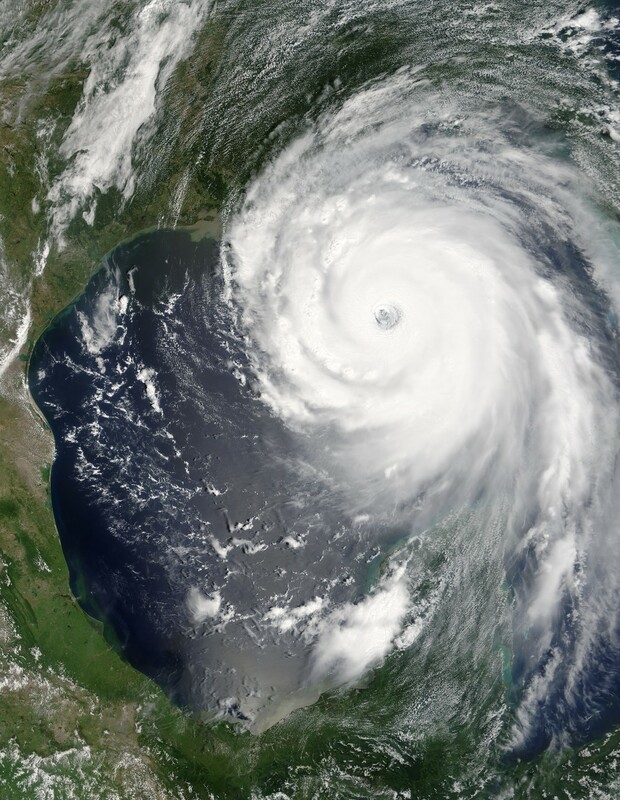 The strongest, Category 5, storms include Hurricane Katrina in 2005 with winds of over 280 km hr-1. Tornadoes are smaller, violent whirlwinds that can form below a cumulonimbus storm cloud, a region of intense vertical convection. 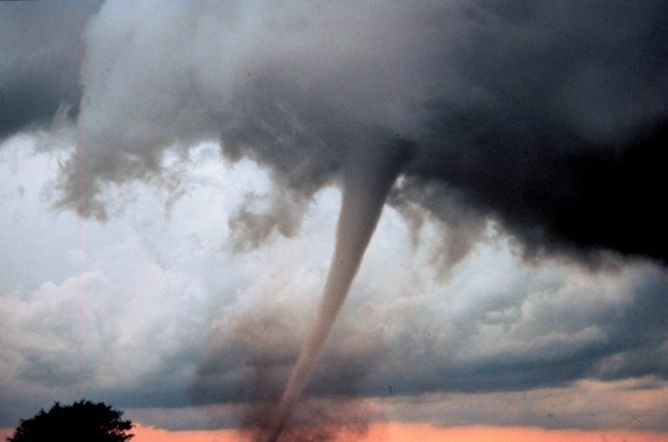 A funnel cloud forms in the centre of the vortex, although the strong winds circulate much further around it. The most extreme winds are almost 500 km hr-1, and result in extreme damage along their path. The Tri-State Tornado of March 1925, had the longest path length recorded at over 350 km and killed 695 people in the Mississippi River Valley, US. It was part of an outbreak with a combined death toll of 747, but even that was exceeded in April 1989 by the Daulatpur–Saturia tornado in Bangladesh, when more than 1,300 people died and 80,000 were left homeless. Dust storms occur in many parts of the world and can transport sand and finer mineral grains from one continent to another. In North Africa these storms are known as haboobs and are often initiated by the high winds associated with thunderstorms. Similar storms occur in the drier parts of the Americas and Asia. Haboobs can reach heights of more than 1 km, cover thousands of km2 and last for hours, the lofted dust absorbing sunlight, warming the air and intensifying winds at the storm’s edge. On Earth, water droplets will nucleate on the finer dust grains, eventually removing them and limiting the growth of a storm, but on Mars, which is much drier, some dust storms can eventually cover the planet. 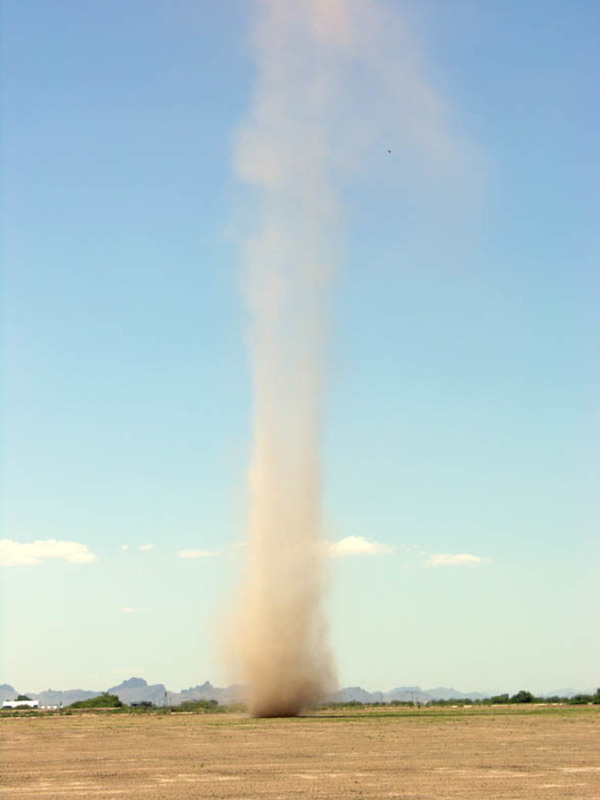 Dust devils are small convective vortices, made visible by the dust that they lift from the surface. They are also driven by heat energy, where a cooler atmosphere is in contact with a warm surface. This is most common in desert-like regions, but they can happen even in temperate climates and there are recordings of 'snow devils' on brightly-lit mountainsides. On Earth, they may reach 1km high and perhaps 10 metres in diameter; on Mars they have been seen over a much wider range of sizes, extending up to 20 km high and 200 metres across and appear in many images from orbiting spacecraft. Lightning is a common phenomenon in Earth’s atmosphere, occurring in regions of strong vertical convection. About 2,000 thunderstorms are active at any moment. Air in the narrow centre of a lightning channel can briefly reach 30,000°C, five times the temperature of the surface of the Sun. 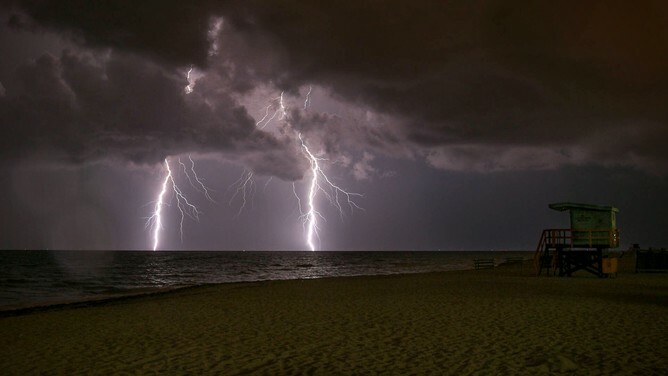 The thunder sound comes from the rapid expansion of the heated air and trees that are struck are literally blown apart as water within them instantly boils. Hail is generally associated with thunderstorms and is also a warm weather, convective phenomenon. People often regard hail as a winter event, but late spring and summer is the only time that true hail occurs in the UK. When there are strong updrafts of air, hailstones can reach very large sizes, up to 20 cm in diameter, and can weigh almost 1 kg. 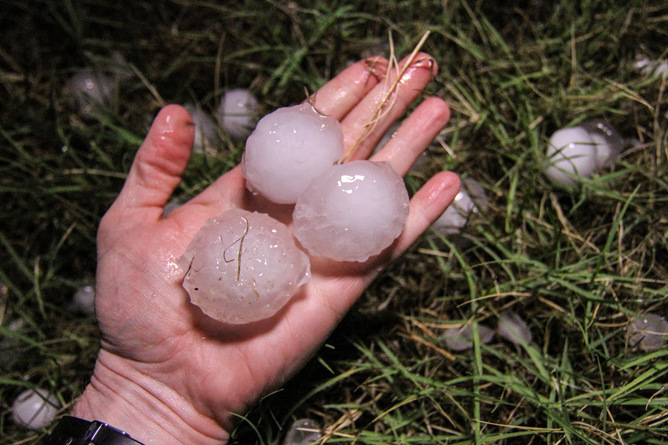 Hail storms can be truly deadly and sadly there are records of many hundreds of deaths. Possibly the deadliest hailstorm recorded killed more than 230 people and 1,600 livestock in Uttar Pradesh, Northern India in April 1888, and there are written records of fatalities in Warwickshire, England as far back as May 1411. Stephen Lewis, Senior Lecturer in Physical Sciences, The Open University.